Home »Posts Tagged "Flat shoes"
Premium quality shoes are made to last, but they still subject to excessive wear and tear compared to all clothing items. People from “Walking on a Cloud” compiled this winterizing guide, to show us how we can prolong their life and save some bucks in the long run. One pair of shoes will not fit for every occasion. 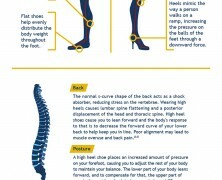 This infographic by aquapillar.com helps you choose the right files for different occasions and highlights some facts from shoes’s history. Heels are considered the symbol of femaleness but this report reminds us the hard part of being woman. Ladies don’t give up – follow the suggested tips and you will make it!